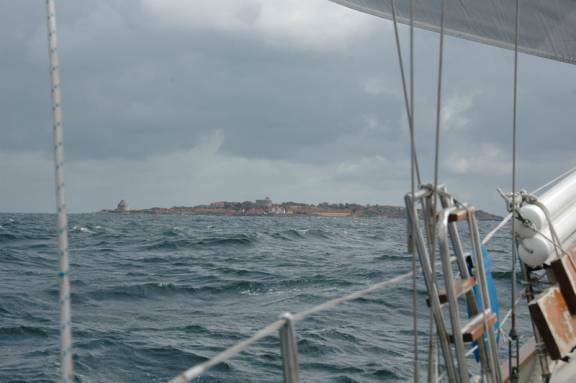 The weather turned out to be very good for our 27-hour passage to Bornholm, a distance of about 150 miles. It was mizzen and Genoa all the way with an east-southeast wind that ranged from 10 to 20 knots. 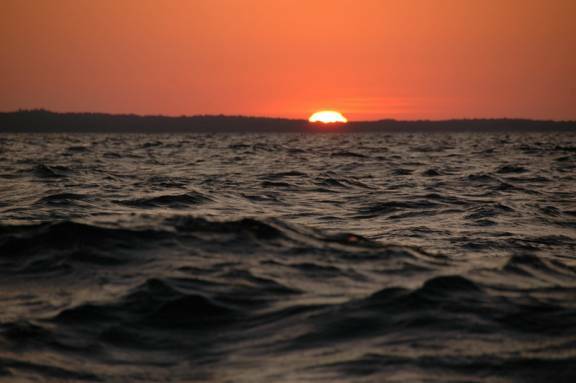 The seas were large, but it was not nearly as difficult as our passage in June eastward from Sweden to Finland. The moon was new (little to no light), so it was a darkish night, but the stars provided a bit of night sparkle. 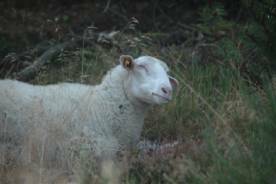 As we approached Bornholm, around 3:30AM we heard a pan-pan call on the radio. A May Day call indicates lives are in danger of being lost; pan-pan is one step down. It was a sailboat about the same size as Pilgrim off the southern tip of Bornholm. They had lost their rudder. 8 people on board! 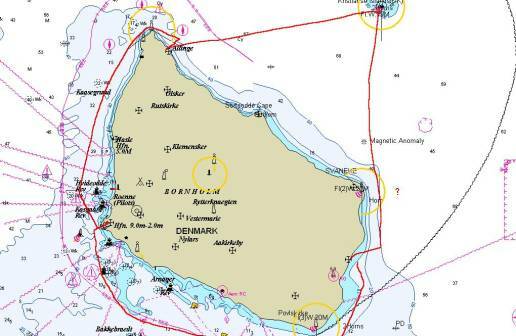 The Danish radio operator organized the rescue effort and dispatched a rescue boat in less than an hour from Bornholm. We were still 2 hours from the location and remember the problems we encountered when we towed a 36-foot steel powerboat in 2006 in the ICW in strong wind and a lively chop. We arrived just after the rescue craft and observed the process of securing a line to the sailboat. It was not an easy task since without a rudder the sailboat was pitching and yawing in an uncontrolled fashion in the 4-foot seas and 20 knots of wind. Once the cable had been secured the task of towing the unstable sailboat at less than 5 knots to the harbour 8 miles away became the main problem. Last seen the rescue boat and wildly pitching sailboat were working their way against strong a headwind, high seas and freighter traffic. Rønne was a port of refuge for us last May when we tired of doing battle with a northeasterly storm during our fist two days in the Baltic. We enjoyed the town’s beauty and hospitality then, and were glad to return for a longer visit and a circumnavigation of the island. 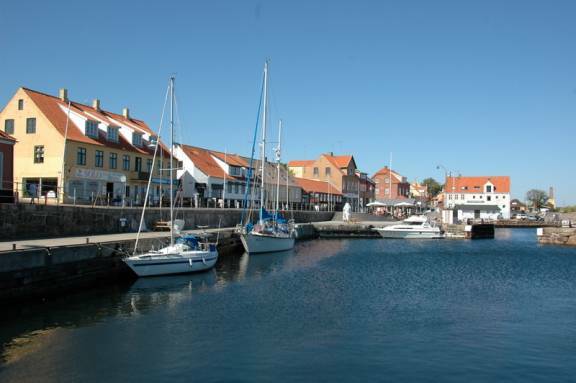 Everyone arrives on Bornholm in a boat (ferry or pleasure craft) or plane. 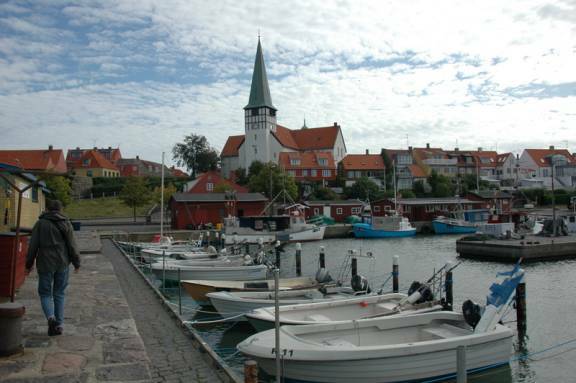 The Rønne harbour is therefore busy with ferries from Ystad, Sweden, Sassnitz, Germany, and Koge, Denmark. We were able to dock at the Southern Boat Harbour, probably the oldest harbour in Rønne. It is still used by local fisherman in small boats and the S/V Mester. We stayed in Rønne for 9 days while daughter Amelia visited and then were storm-bound for an additional 3 days. 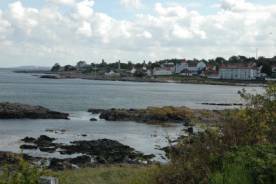 The South Harbour is where the larger fishing boats and repair yards are found, although there is also room for pleasure craft. A cormorant was successfully diving for food, and a black-backed gull actually tried to attack it and swipe the fish out of the cormorant’s mouth. The Nørrekås Lystbådhavn is the marina for pleasure craft north of the commercial port, but the depths are too shallow of Pilgrim. This was originally the major fishing port in Rønne. From our dock we had a good view of the “post-bombing houses.” These homes were built after the Soviets bombed Rønne (Bornholm had been occupied by Germans) on May 7-8, 1945 when the Germans did not leave. 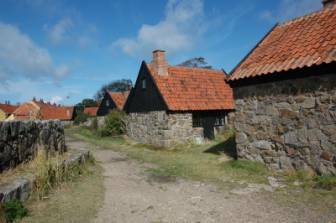 Bornholm’s older buildings (1700-1900) were constructed of half-timber and brick. The brick was often covered with stucco and painted bright colours. 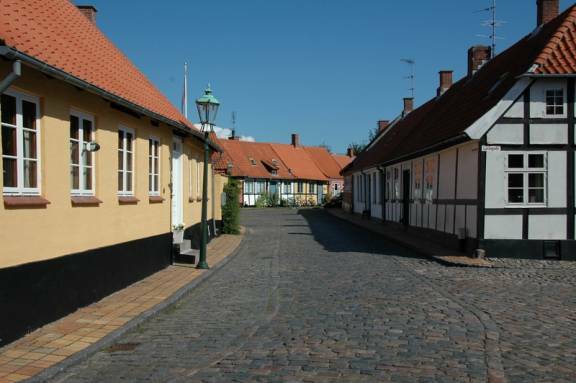 The cobblestone meandering roadway Vimmelskaftet has some of the best-preserved older homes. Rønne Theatre was built in 1823 and is the oldest actively used theatre building outside Copenhagen. 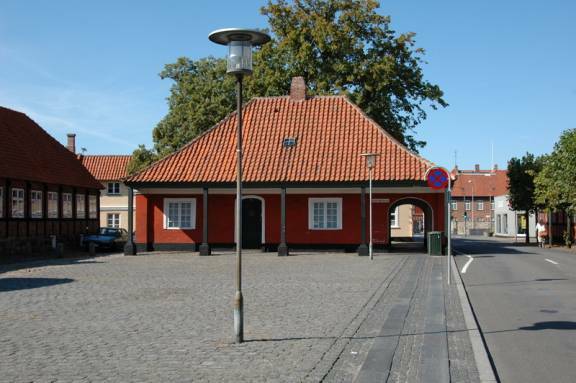 Hovedvagen gate was built in 1743 and was the town gate as well as a guardhouse and a jail. 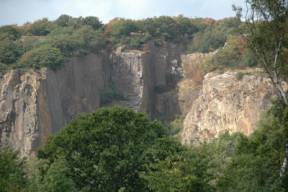 It was built with stones from the abandoned Hammershus Castle (north on Bornholm). 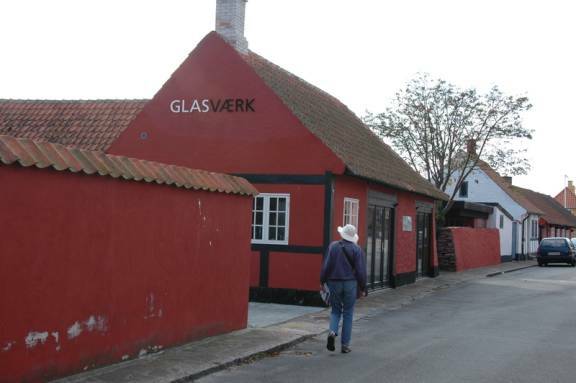 Merchant Rønne Gård was built in 1813 and has a belvedere on the roof from where the merchant could keep an eye on his ships in the harbour. 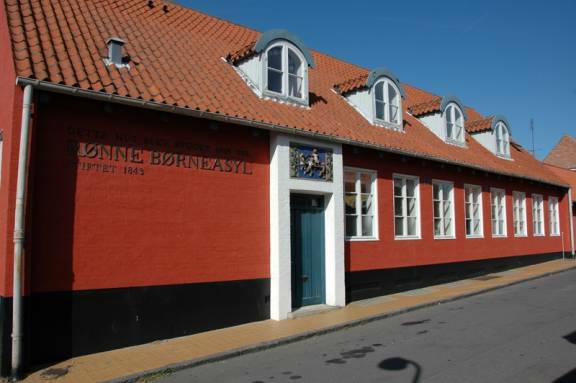 The Rønne day nursery was founded in 1843. The original building was damaged and torn down after the 1945 bombing and rebuilt in 1949. Lille Torv (Little Square) is dominated by the Post Office, built in 1910. Store Torv (Big Square) is the centre of commerce and shops. It was originally a drill field, and most of the half-timbered buildings have been replaced by modern multi-story brick buildings. 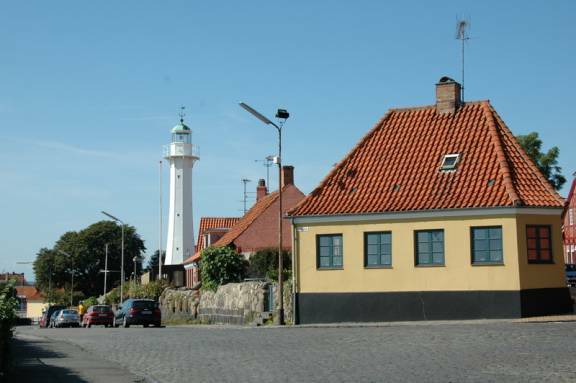 The earliest continuous “residential area” (suburb) was near Nørrekås Lystbådhavn, the original fishing harbour, in Fiskerstræde. The houses were built in 1853-54. The houses originally had a continuous window ledge running beneath the windows. Due to the terrain, the houses on the higher east side of the street have a wooden ladder/staircase leading up to the front door. The lighthouse was built in 1880. The lighthouse in the harbour “Kongen” was built from Barnholm granite in 1930. 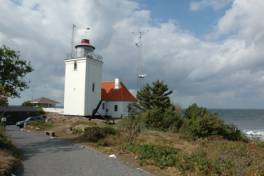 A similar lighthouse appears on the northern tip of the island at Hammer Odde. None of these lighthouses are still in operation, but they look beautiful. The Church of St. Nicolas perched on a hill over the harbour hovered over Pilgrim. The original church was built in the 1200’s, but it was rebuilt in 1915. The church showed its reformed tradition … somewhat stark after the orthodox and Roman Catholic churches further east (Russia to Poland). 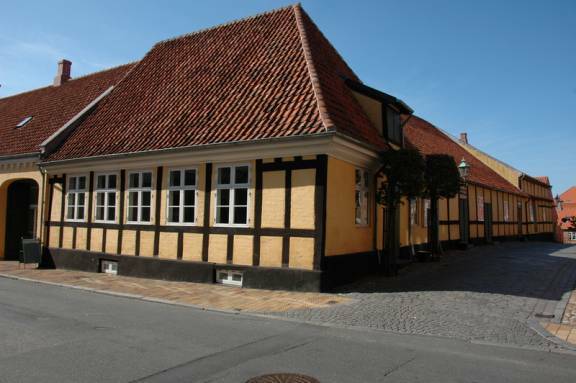 We attended one of the weeklong Bornholm International Organ Festival concerts here. 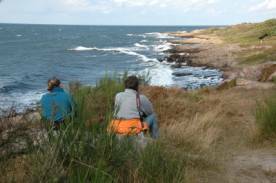 The local bus company on Bornholm offers daylong specialty tours: 3 different craft tours, a garden tour and a food tour that we took. It included visits to see cold-press rapeseed oil and mustard production, aquavits & bitters production, a handmade chocolates shop, a vineyard, honey production and a brewery. We got samples of most products and lunch at the vineyard. The vineyard has mainly produced berry wines, but is getting into grape-based wines. The major attraction at the vineyard (for us) was the hutch of rabbits and the goat. Amelia’s visit provided us a good reason to rent bicycles for the day. The bicycle paths on Bornholm are excellent, either with a bike lane on the side of the road or on the old railway right of ways. We decided to go to Nylers to see one of the 4 round churches and then go on to Aakirkeby for lunch. Unfortunately, Jane was in the lead and missed one critical bicycle path sign, so we went out of our way and on roads with steeper hills on our way to Aakirkeby. We followed the path back to Rønne and it was a much easier ride. 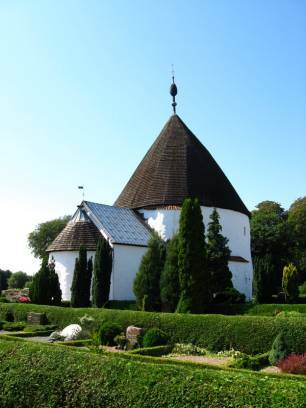 There is much speculation about the origin of the round churches. They were built in the twelfth century, and possibly were connected to the Knights Templar who built round churches with arrow slits, based on the Church of the Holy Sepulcher in Jerusalem. 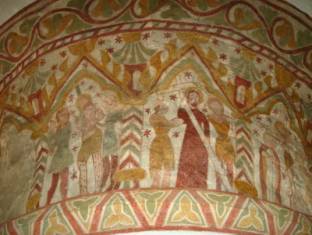 The Nylers church is known for its wall paintings. 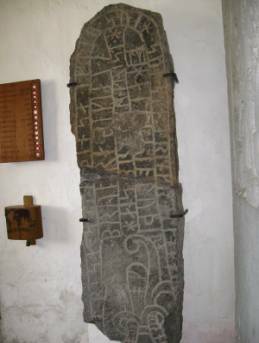 The porch contains two rune stones, the older one being from about 1050. The church is still in use today, and has a well-kept cemetery in its walled garden. On our way back from lunch in Aakirkeby, we stopped by an informal gallery of stone carvings / paintings by artist Hans Schouw Andersen, known as Slau’s Stones, Uglegård Farm. In 1988 after being awarded early retirement due to illness, he suddenly had time on his hands and certain artistic abilities emerged that no one knew he had. 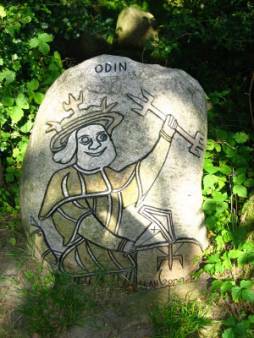 They resulted in this stone park where visitors encounter the fairytales of Hans Christian Andersen, the Norse gods, the subterranean inhabitants of Bornholm and much more. In 1990 Bornholm County commissioned the excavation of a pond along the cycling track to provide a habitat for the endangered green tree frogs. 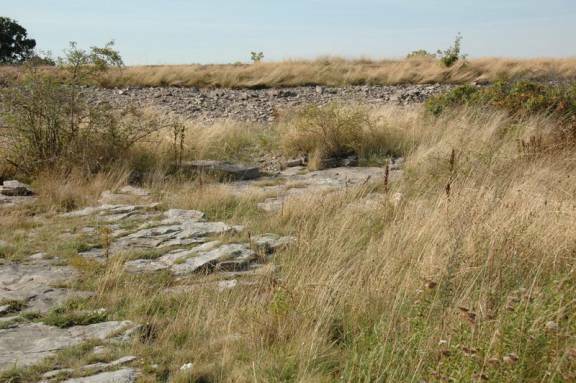 This inspired Slau to make a small lay-by for cyclists, so he cleared an area of thicket and underbrush, gathered some unhewn stones to decorate the area and set up seats of stone. The very first stone he worked up is the small stone by the large oak tree with the inscription “Herman.” It was made because an old neighbour always dropped by for a chat during Slau’s efforts to find the right stones, so he was given this seat as his very own. The next stone to be erected is inscribed “1990” and the others followed in quick succession until 2004 when the last stone was made and erected. Artist Hans Schouw Andersen, known as Slau’s Stones, Uglegård Farm. 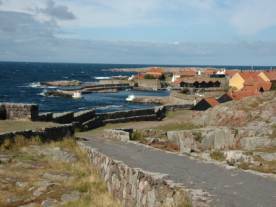 Our second port on Bornholm was Allinge on the NE tip of the island. You really had to put your faith in your charts and navigation skills coming into this harbour. Since it is exposed to NE storms, there is an outside breakwall. When you get inside of it there is a SHARP right hand turn into the outer habour, then a left hand turn through a storm lock into the inner harbour, which is where we docked. We found the smokehouse for herring and salmon. The smoking process used is based on a technique learned from the Scottish soldiers who were stationed on Bornholm a couple of centuries ago. They hang the fish in the chimneys to smoke. 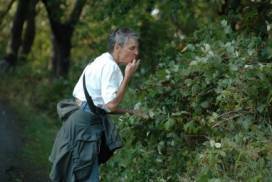 This is also the way the Dutch used to smoke herring and eel. 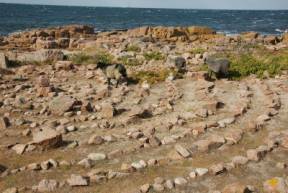 We walked to two sites to see the rock carvings from the late Bronze Age. Most of the pictures are cut into granite about 1-10 mm deep and are mainly of ships, circles, feet, or just round “cup” marks. At Madsebakke the carvings have been painted red since the carvings can be difficult to see with the erosion of time and growth of lichens. These carvings were probably made over a 400-year time span in the latter part of the Bronze Age more than 2500 years ago. 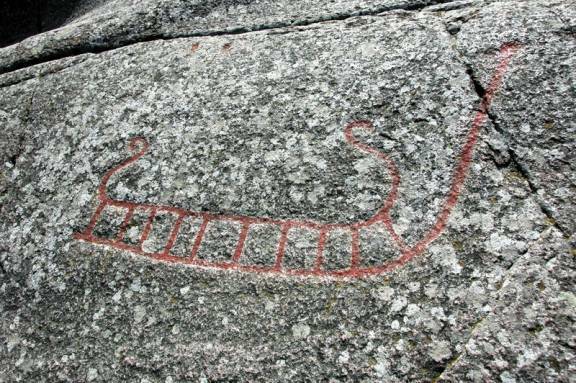 Because granite has been quarried on Bornholm for over 100 years, many carvings have been inadvertently destroyed. The carvings at Hammersholm have not been painted. On the first rock we could clearly see the carvings, but on the other rocks they were not visible in the sunlight. Hammershus castle ruin, the largest in Northern Europe, is on the west side of the island and its origins date back to 1149 and a dispute over who would be heir to the throne of Denmark. Archbishop Lund was given the land as compensation for being wrongfully jailed by King Svend. About 100 years later there was another dispute and when the archbishop refused to crown the king’s son. It was about this time the archbishop began construction on the castle, possibly on the foundations of an older castle on the site. From the 13th to the 16th century the king repeatedly conquered the castle, but he always had to give it back to the archbishop of Lund. In 1522 Lübeckers from Northern Germany overran the castle in a siege that lasted only 36 hours. This was in retaliation for Denmark’s attempts to limit the power of the Hansaetic League. 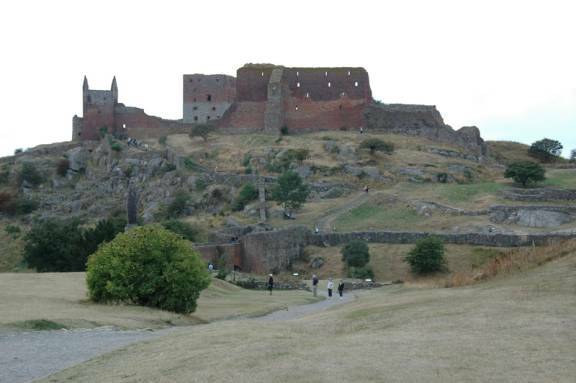 The victors began to tear the castle down; when King Frederik I mortgaged Bornholm to Lübeck for 50 years, the Lübeckers initiated an extensive rebuilding of Hammershus. 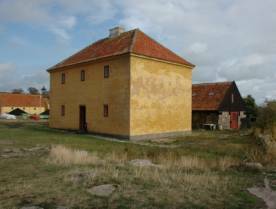 Their building material of choice was large red bricks made in Germany and shipped to Bornholm. 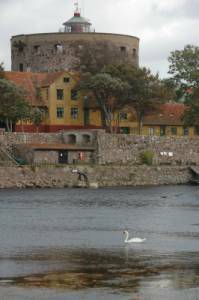 When war broke out between Sweden and Denmark in 1645, the Swedes gained control of the castle when the one Dane who knew how to operate the guns was seriously wounded at the first firing. 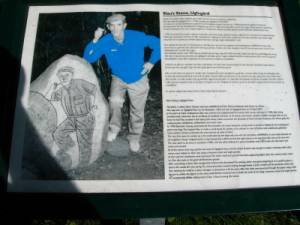 Local Bornholmers rebelled against Swedish rule in 1658. When the Swedish commandant went to Rønne to dispatch a ship to Sweden for reinforcements, he was attacked and killed by rebels. 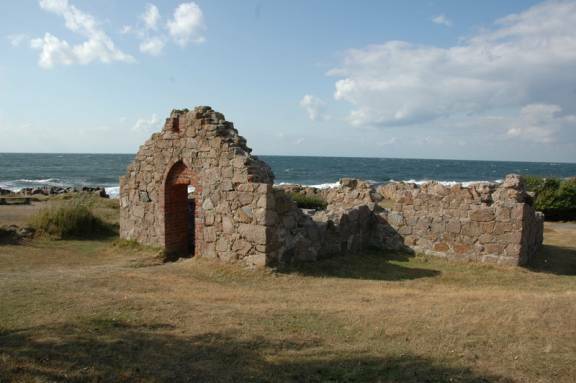 One of the rebels put on the commandant’s clothes and the group of rebels went to Hammershus threatening to behead the “commandant.” The Swedes surrendered unconditionally, and Bornholm has been Danish ever since. 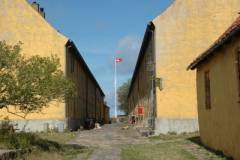 The Danish king used the castle as a jail for political prisoners. Hammershus was abandoned in 1684. In 1743 it was decided to pull down the castle. 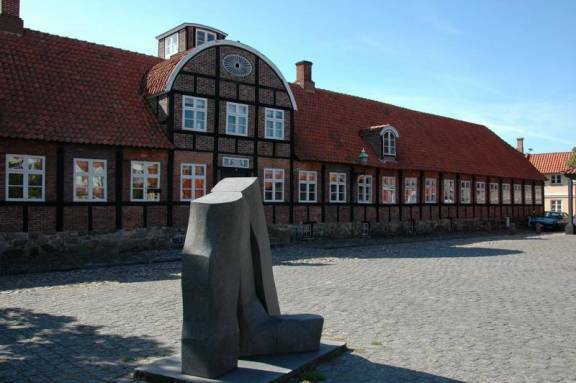 Citizens of Bornholm were allowed to purchase building materials from the castle. 50,000 bricks and 6,000 tiles were carted away. In 1822 a preservation order was placed on the ruin and currently restoration is underway. 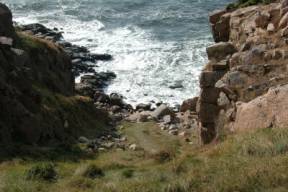 During our walk to Hammershus we got good views of granite cliffs, an abandoned quarry, and the old lighthouse on the very northern tip of the island. 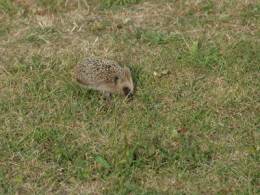 We also saw one of the common mammals on the island, a hedgehog. During the first week of September most of the Baltic Sea was under gale warnings, from Skargaret to the Bay of Finland. The bad weather gave us extra land time in northern Bornholm. As we set out on a coastal walk round the north tip of the island, we could see white seas about a mile offshore, and big humps of waves on the horizon, but all in all it did not look too bad. 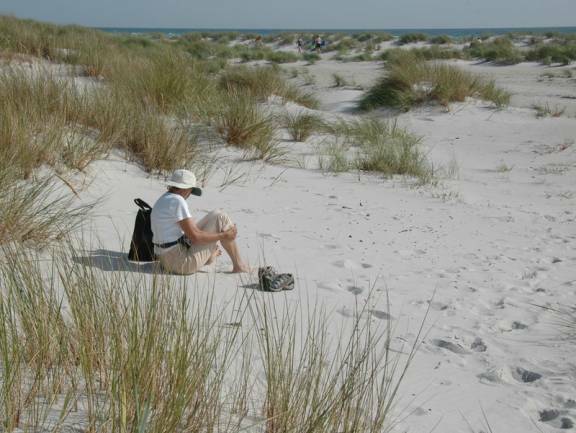 We walked through the little village of Sandvig north of Allinge with a beautiful sandy beach. Then we took the footpath the hugged the coastline and the further we got around the top of the island, the bigger the waves and the windier it became. The coast is steep, rocky and the waves were spectacular. This was the domain of sheep. We stood trying to figure out if a collection of stones formed a labyrinth when three sheep bounded down the hill, through the labyrinth and down to a protected pool to drink. They were totally unfazed by humans in their territory. Later we passed a small lamb ruminating on the side of the path, happy to let us take a picture, never batting an eyelash. At the very tip of the island we found the ruins of Solomon’s Chapel, built in the twelfth century for fishermen who fished the waters off the coast, mainly for herring. Further along the coast we saw a few long deep fissures in the coastline, reminding us of some of the Irish coast. Breathtaking. It was not surprising that we saw no pleasure craft out. 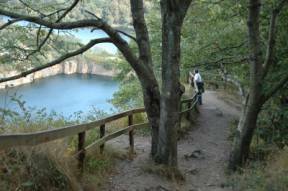 We walked back to Allinge through an abandoned quarry, with more magnificent sights overlooking the lakes created by quarrying. We also got up to the old (1871) lighthouse, which is a beautiful structure. We finally left Allinge after 4 days when we had a short window of moderate wind for a great downwind sail until exactly noon. The heavens opened up and the wind picked up over 20 knots. We clawed the sails down and made it into the tiny port of Christiansø only to discover there was limited room in the harbour. Local boats seemed to straddle multiple mooring positions, and there was no harbour master or signs to help us understand where visitors could moor. Several false attempts on the main quay prompted other boat visitors to open up a bit more space between boats and with a great deal of shore help we were able to secure Pilgrim to the wharf. The rain continued to pelt down and with 20-25 knots of wind blowing us against the dock; we were not going anywhere soon. When the rain passed a rescue helicopter crew from Sweden came down to the docks to have a look at the marooned boats. We are not sure if it was an inspection or just a courtesy call but they invited us to have a look at their craft. A winding path up to the top of a nearby hill brought us to the Search and Rescue helicopter from Sweden. They are apparently engaged in join training missions with Denmark Search and Rescue. The crew consisted of 2 pilots, a diver, and a winch operator. We talked about how they approach a mission, what boaters could do to better assist in both medical and boat evacuations and what equipment they deem vital for boaters to carry. We them watched them take off in 25 knot winds. It was a great learning experience and the crew did a fabulous PR job. We are not familiar with their funding scheme but it is a public service that is truly worth every penny. 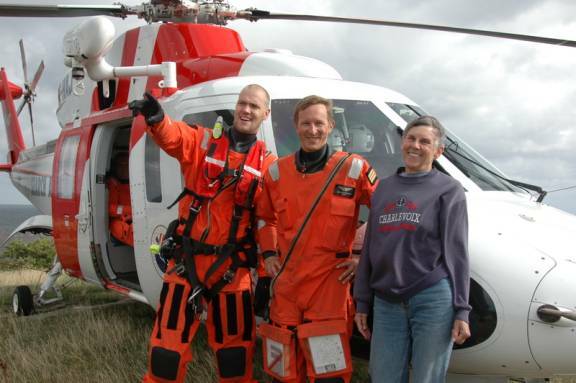 A very friendly SAR crew from Sweden on a training mission. They gave us the following web sites for information regarding their mission http://www.sjofartsverket.se/templates/SFVXPage2691.aspx and about the company that provides helicopters and crews http://www.norrlandsflyg.se/en/home . 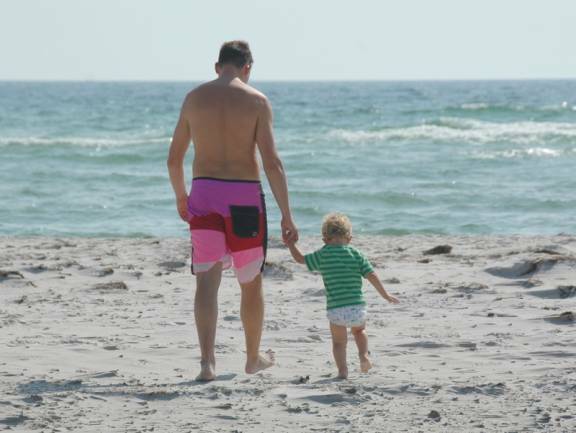 Without belaboring the point, one of their recent rescues involved a father (with only one arm) and son sailboat trip that ended with the father being knocked overboard, at night, in a storm in the middle of a shipping lane. They had no VHF radio, only a mobile phone that did not work in the area they were in. The son had to sail back toward Denmark, abandoning his father, until the mobile phone worked. His call was routed to Search and Rescue at 3AM and a helicopter was dispatched. The crew picked the son and GPS up from the boat (now technically abandoned) and managed to create a search area that took into consideration wind and currents and probable location of the father. They located the father within 5 hours and happily he is recovering. On a lighter note we explored the island of Frederiksø (which is joined by a footbridge to Christiansø) later in the day. The two pickled herring booths were closed and aside from a prison building not much was open either. 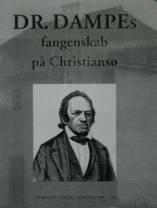 The prison’s main claim to fame was that is housed Dr. Damepe for 15 years. He was a political prisoner who wanted to replace the absolute monarchy with a democratic constitution as well as demanding Freedom of the Press. Both islands were a navel base from 1684 until 1855 and are still managed by the military but without defenses or personnel. The perimeters of the islands have stonewalls and bastions. 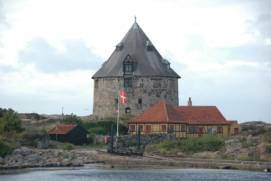 A small tower stands on Frederiksø and a large tower with a lighthouse inside that extends out of the top, is on Christiansø. There are barracks and soldier’s huts, and storehouses, some in ruins, from the military era. 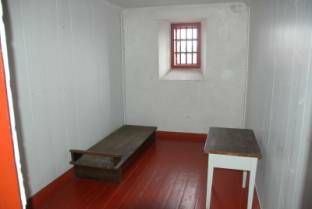 The barracks and huts have been modernized and about 100 people live on the islands year-round. There is a library, a kiosk (souvenir / ice cream shop), an inn with a restaurant, and two stalls that sell pickled herring. In the summertime some of the huts are rented out as holiday homes or to artists. The third island in this group is Grasholmen, a bird sanctuary that is a nesting site for Razorbills (700 pairs), Guillemots (2,000 pairs) and gulls (10,000 pairs). Eiders nest on all three islands. Since being on Christiansø the only seabirds we have seen are gulls, a swan pair, and cormorants. 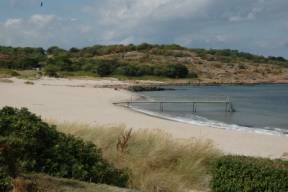 We saw camouflaged nets on Christiansø that are used to capture, count and tag migrating birds. We did not find Christiansø a friendly place, possibly because the locals are not comfortable speaking English. All of the island signage is in Danish or German. The harbour is advertised has having 60 guest places for visiting yachts. There was only 50 feet of along side dock space available for the supposed 60 guest places. The stern mooring balls were set in places where the maximum depth was only 5 feet and they were for the most part occupied by local runabouts. Ferries, fishing boats and local runabouts, took the rest of the space. There were only 3 other visiting yachts we could identify in addition to ourselves, and we do know where another boat would have fit excepted rafted to one of us. As it was we were encroaching on a reserved spot for the post boat. There was enough of a surge in the harbour from the SW winds, up to 30 knots, that rafting would not have been safe. This is definitely one of those tourist places where the advertising far exceeds the ability of the location to deliver. It would have been far cheaper and safer to take the ferry and spend 3 hours on the islands. This place does not deserve the press it has received. The harbour master was only interested in collecting fees to, as he said, “finance his trips to the Caribbean in the winter.” Wireless Internet although installed “was only for office use” and not available to tourists. None of the shops were open until the ferry arrived. All of the museums charge a very high individual entrance fee suggesting they are mainly for organized tour groups. They closed down for the season on Sept 1. A very disappointing harbour. Pilgrim is encroaching on the supply ferry space, there is one other visiting boat behind her in addition to the large powerboat on the other wall. All the other boats are local. There is no room for other visitors. When they say there is room for 60 guest boats they must mean 5 foot dinghies rafted 4 deep. Take the ferry if you must go to this harbour. The 3 hours you get to look around is more than enough. 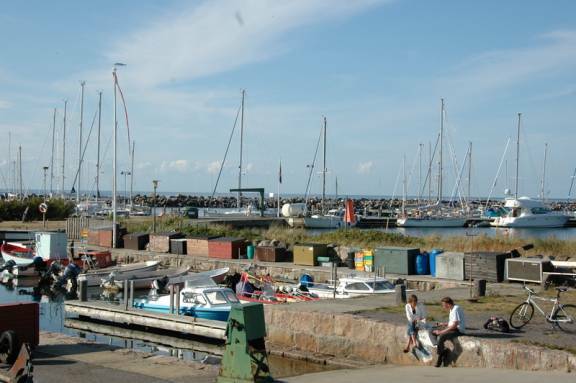 This is also the most expensive of all the Bornholm harbours we have visited. 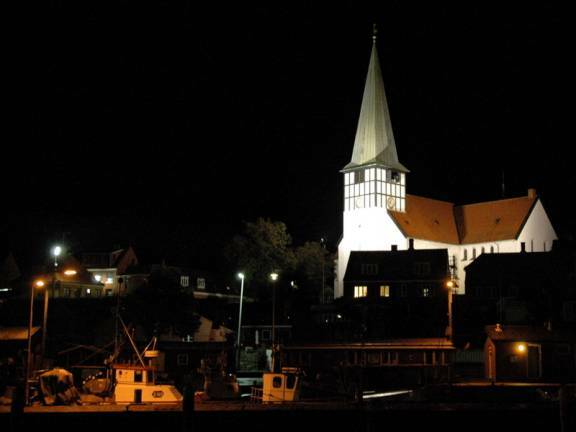 (Rønne, 140 DKK/night = $28, Allinge, 120 DKK/night = $24, and Christiansø, 180 DKK/night = $36) Allinge was the best deal, since it included showers and Internet in the harbour fee. The only way to change the situation is for cruisers to boycott Christiansø until the island gets its act together. 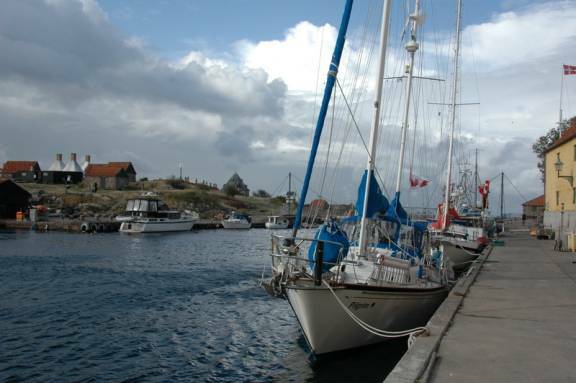 Our last port on Bornholm was Nexø, the southern-most harbour on the east side of the island. 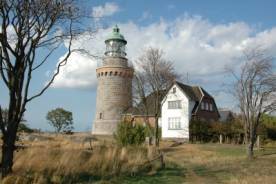 We planned to wait for a weather window for the 60-mile run to Rügan island in Germany. Nexø was a major fishing port and had fish processing plants until the waters were over-fished. Now the town is in economic decline. 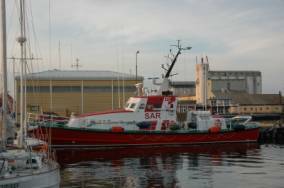 The extensive harbour had some fishing boats, is the destination of a passenger ferry from Poland, and has a small area for pleasure craft. None of this is clear in signage or on charts. We docked Pilgrim in the “overflow” pleasure craft area since we saw another large boat there. 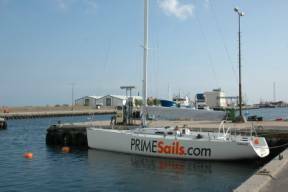 It turned out to be “Express,” the German sailboat that had lost its rudder and was towed by the Sea Rescue Boat on August 21 when we arrive on Bornholm. 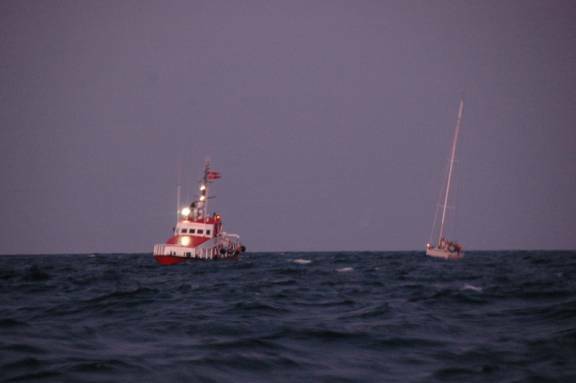 The disabled 42-foot sailboat still missing its rudder and the SAR rescue boat that towed her to Nexø. The harbour was run-down. Showers and toilets were not clean. Retired fishermen gathered at their meeting room early in the morning and drank beer all day. Many of the storefronts in the city were closed. There was no Internet available, even at the library, which was open, but not staffed every day. The walking tour suggested in the tourist guide started in the main part of town, but quickly departed for the southern coastline with its nature reserve. 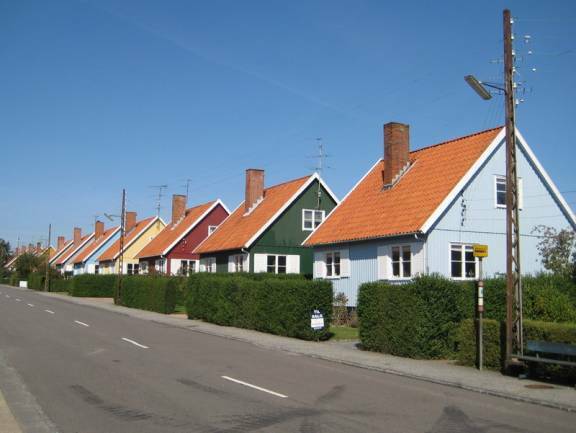 The Swedish wooden houses were mentioned, but there was no indication of where they were located. 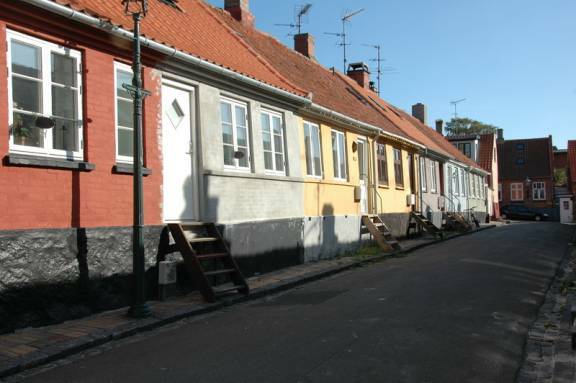 These houses were donated by Sweden to Nexø after the May 1945 Russian bombing that wiped out half of the homes in Nexø. The harbour master told us where we could find them, and we did finally locate them, although they are not particularly interesting. Much has been made of this bombing of Bornholm. The German marines were instructed to vacate the island as part of the German surrender after WWII, but German Commandant von Karntz either would not surrender or could not leave (depending on who is telling the story). 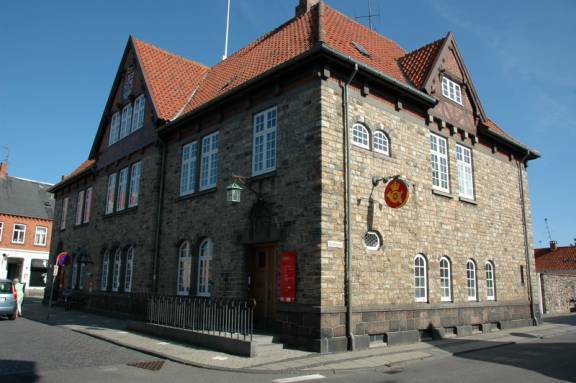 Attempts to contact the Danish Foreign Office in Copenhagen failed because the city was celebrating the end of the war and no one was available to answer the telephone. The Russians bombed Nexø and Rønne. The causalities after a cease-fire are sometimes that hardest to reconcile. We were there on a calm day, so there was not much paragliding going on. There were families enjoying the late season warm weather, and dogs racing along the edge of the water. On our way back to Nexø we stopped at a nature reserve to observe the Canada Geese, and to see Langeskanse one of the island’s longest (600 meters) ramparts made of pebbles. Ramparts made of pebbles. Defense against what? 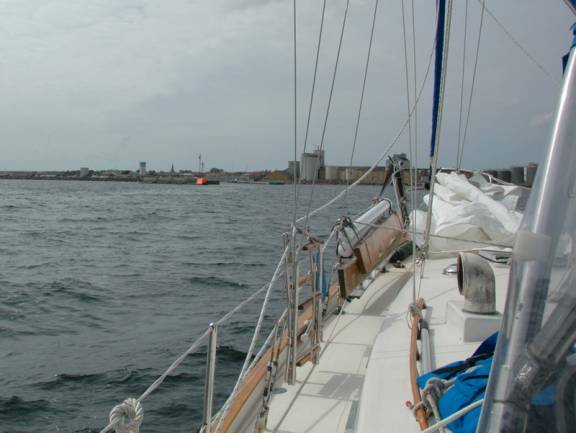 We were up for a dawn (6:20AM) departure with 10-15 knot NE winds that kept us sailing until 10 miles from Sassnitz, Germany, when the wind petered out, but the waves slowed our headway. We dodged the cargo ships, ferries, excursion boats and fishing boats and entered Sassnitz harbour and found a mooring at around 4PM.